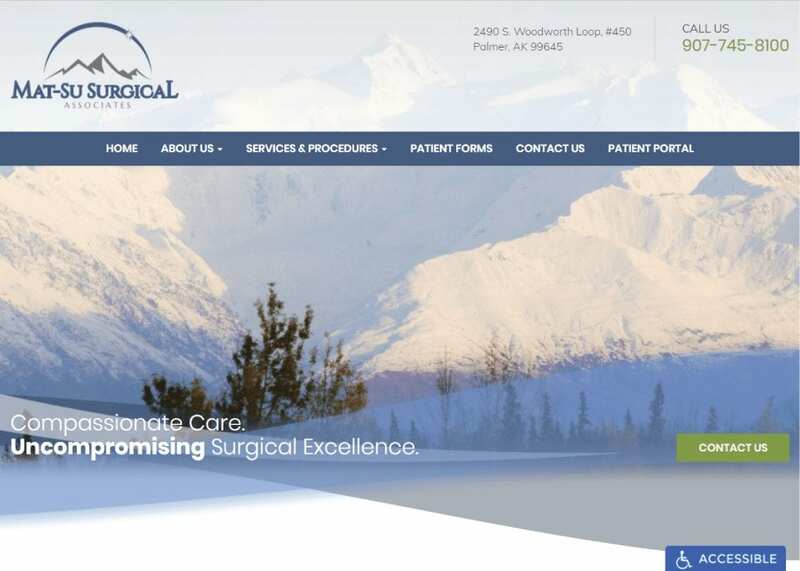 Mat-Su Surgical Associates aims to be at the forefront of their respective industry by providing top-notch surgeries in a wide variety of fields. When dealing with a surgical specialty, it is especially important to remain professional and compassionate at all times. We helped incoming visitors feel at home through our use of imagery depicting different natural landmarks and views from around the world. The website is designed to be modern and sleek. Along with the natural imagery, we aimed to highlight the different informative articles on our navigation menu as well. Educating and informing patients can help set them at ease and are much more willing to commit to some form of surgery if executed properly. To complements the white snow-capped mountains and other natural sceneries, we implemented blue throughout the website as well. The use of blue represents dependability and loyalty – two key aspects for any top-tier surgeon. The natural scenery also depicts calmness and tranquility. Patients who seek surgical services are understandably scared and worried. We made sure to set these patients at ease through our use of color. Marketing plays a huge role in any website’s success. The surgical doctors understood this and placed a patient portal, along with patient forms, available on the website for patients to access. Quick links (located on the bottom of every page) also provide easy access and increased engagement for readers throughout the website. The website also has an ADApt option which allows patients with disabilities to access the website just like any other patient. Patients can modify the images, spacing, typography, and even the special effects on the images to their liking, as a result. This also shows the lengths and strides the team will go to ensure that all their patients are satisfied with the experience from start to finish! The website reflects the feeling of assurance and trustworthiness. From the scenery to the glossing effects, new site visitors will instantly feel at peace with our serene layout. Patients will be nervous about surgery; after viewing our custom website, this will no longer be the case!